Submitted by Lisa K on Mon, 2009-03-09 18:55. The Times' editorial board thinks there may be hope that the dream of Senator Daniel Patrick Moynihan, and now Senator Schumer, may be realized. With the leadership of Senator Schumer, federal stimulus money and a major role of the Port Authority, New Yorker's may finally get the train station they deserve. Below is their statement in its entirety. After years of starts and stalls, replacing New York City’s gloomy, subterranean Pennsylvania Station with an elegant transit hub suddenly looks possible again. 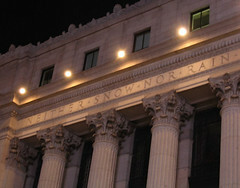 Veterans of this project and its many iterations see a glimmer of hope that the grand old Farley Post Office on Eighth Avenue can still be converted into a splendid new railroad hall named for the late Senator Daniel Patrick Moynihan. That renewed hope is there for two main reasons. First, Washington is handing out money. Second, Senator Charles Schumer, New York’s high-energy force on Capitol Hill, has moved the Moynihan project up on his priority list. In a speech last week to business leaders, Senator Schumer laid out a cogent plan for making the new station come to life. Amtrak’s new leadership would have to play a major role and agree to make Moynihan the point of departure and arrival for its Northeast Corridor trains. As a grand open hall — more a renovation with a new skylight than some of the dramatic and complicated schemes of the past — Farley would then become the uplifting gateway to New York City. The overall scheme would also allow for major renovations to the existing Penn Station, now an intolerably confusing maze. The Port Authority of New York and New Jersey would also be asked to play a major role. The authority has many items on its to-do list, including rebuilding at ground zero and creating a new tunnel under the Hudson from New Jersey. But as Mr. Schumer and others argue, it makes sense for the authority to coordinate what is essentially a major Midtown transportation project. Mr. Schumer suggests, rightly, that the authority could contribute at least $1 billion of the money it now has earmarked for city projects. 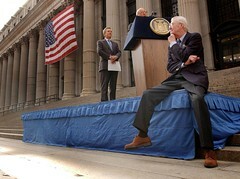 That would be added to $250 million designated for Moynihan that’s been sitting in the bank for years. Finally, Mr. Schumer and others want to move swiftly to get their hands on some of the money for high-speed rail and Amtrak included in the new stimulus package. Mr. Schumer’s point, and one that deserves repeating, is that in the Great Depression, New Yorkers went for the sky. They built the Empire State Building. Now it’s time to reach again, to use the present economic crisis to fulfill Senator Moynihan’s enduring dream of a great railway entrance into New York City. Read The Senators’ Railway Station in the New York Times. Submitted by keenan on Thu, 2008-05-22 10:02. As a bistate agency, the Port Authority is not subject to the Public Authorities Control Board, which gives final approval on financing for public projects in New York State. 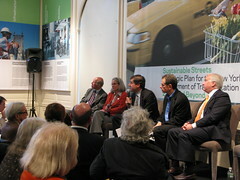 In recent years, Mr. Silver has controlled the PACB, and has used it to wield influence over a number of development projects — most notably to kill Mayor Bloomberg's plan to bring a new Jets stadium to the Hudson rail yards, and Governor Pataki's plan to convert the Farley Post Office building into Moynihan Station. Proponents of the transfer say the Port Authority could use the $2 billion that is available in its capital plan to plug a public funding gap and get the project back on track. At the end of 2007, the Port Authority, which controls the area's ports, airports, and most New York City toll bridges and tunnels, reported gross operating revenues of about $3.2 billion. The chairman of the Assembly's Committee on Corporations Authorities and Commissions, Richard Brodsky, opposes the Port Authority taking the lead role on the project, and is said to be addressing the matter at a hearing on Friday. 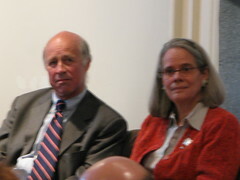 Mr. Brodsky said the problem stems from the state of New Jersey's refusal to alter the governing structure of the Port Authority. "There is no statute that can control Port Authority behavior," he said. A spokesman for Mr. Silver, Daniel Weiler, said: "The speaker's concern is that before jumping on new projects, we need to see existing projects come to conclusion." Mr. Schumer's office would not respond to a request for comment. "The Moynihan Station is a vital project and we are pleased by the discussions of confidence in our role as a builder in the region. But any potential role is up to the board and consultations with the governors," a spokesman for the Port Authority, Steve Sigmund, said. Today, the Port Authority’s board of directors is expected to officially appoint Chris Ward as the agency’s new executive director. Submitted by keenan on Mon, 2008-05-19 10:09. So how do we develop the Penn Station district, given all the recent setbacks and pall of doubt that has descended on big-development projects? I believe there are four steps we must take. * First, project management should be given to the Port Authority. A lack of expertise and money has been the bane of this project, and the Port Authority has both of these in abundance. The agency should use New York's $2 billion share of Port Authority money to make it happen. * Second, even if Madison Square Garden doesn't move, we can drastically improve Penn Station by relocating 200,000 square feet of Amtrak and NJ Transit operations offsite. Further, MSG has said it would be willing to move the WaMu Theater, which would bring daylight into the train station. * Third, the money to achieve Sen. Daniel Patrick Moynihan's vision of transforming the Farley Post Office into a magnificent train station is there. One last step, government approval, is needed to move forward. So let's start building. * Fourth, we should move ahead with creating a special Penn Station zoning subdistrict, allowing for more building and giving more development rights to those who make a contribution to the transportation infrastructure. 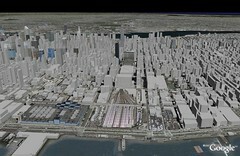 Additionally, Amtrak and NJ Transit should leverage their real-estate holdings to create new commercial buildings. 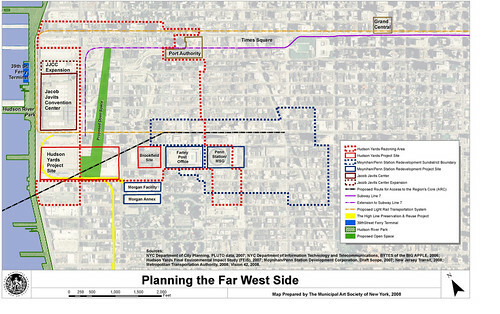 Let me be clear: We should develop the Penn Station area and the Far West Side, not one or the other. But the key to developing 10th and 11th avenues in the 30s and 40s is kick-starting Penn Station development; a new transit hub is vital to support and sustain the major development we all hope to achieve in the Penn Station area and beyond. As it's unlikely that we'll see commercial development on the Far West Side for several years until the new No. 7 line is operational, we need to get the Penn area moving first. Submitted by keenan on Mon, 2008-05-12 15:25. 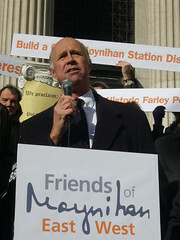 The senator reiterated his call for the Port Authority of New York and New Jersey to take over management of the struggling Moynihan Station project, a new transit hub at the Farley post office. He said plans should proceed assuming Cablevision won’t change its mind about renovating the current Madison Square Garden instead of building a new arena at the Farley site, but that “parallel tracks” should be laid in case the company changes its mind. Progress might inspire it to do so, he said. Mr. Schumer said Cablevision has told him it is willing to move its Wamu Theater, formerly known as the Felt Forum, which would allow a project to bring natural light into the dreary Penn Station below. He added that Amtrak should immediately free up 200,000 square feet at the station, which it owns, by moving “clutter” to a building it owns just south of the cramped transit hub. The senator proclaimed a Port Authority takeover “likely to happen” and said that the agency, unlike the Empire State Development Corp., has $2 billion available and the expertise to bring Moynihan to fruition. 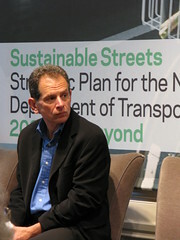 “ESDC is not capable of being a major development agency here,” he said bluntly to approximately 300 businesspeople at a midtown hotel. Mr. Schumer called on the city to create a special zoning district around Penn Station with density bonuses to encourage commercial development. 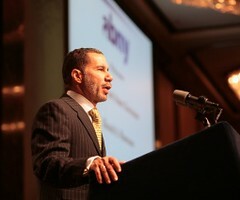 Adding more office space will position the city to take advantage of the inevitable economic upturn, he said. According to the Observer, Mayor Bloomberg responded to Schumer's comments at a press conference this afternoon, indicating that the city "would never agree" to the Port Authority taking over the project. “We certainly would never agree to the Port Authority being in charge of it because they can’t get done what they have to do downtown and the Port Authority’s first job has to be downtown and I don’t see how they could satisfy us at this point in time that they can take on that and do everything else,” he said. Here is a video of the Mayor's comments.